A fresh summer salad to which you can add almost anything for a variation. Dice cheese into small cubes. Add all ingredients together including the mayonnaise. Chill for at least an hour or enjoy immediately. 231 members have added this recipe to their cookbook. For banting, replace mayo with banting mayo or a mixture of cream cheese and full fat yoghurt. Homemade with none of the unhealthy additions. Low carb alternative to using bread crumbs. 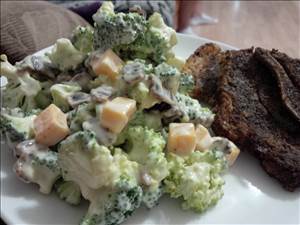 There are 262 calories in 1 serving of Broccoli Salad. Calorie Breakdown: 65% fat, 17% carbs, 18% prot.